Back in Chapter 3 a solution was introduced as a homogeneous mixture of a solute and solvent and you included them in your matter chart for Part G of Chapter 3. A solution is defined as a homogeneous mixture of two or more substances. The two new words that are introduced are solute and solvent. 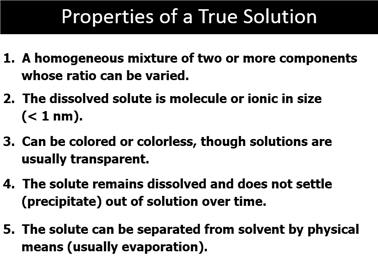 Although we usually think of solutions to be liquids, Table 14.1 Corwin 6th lists some common examples of solutions whose physical state correspond to that of a solvent. 2. 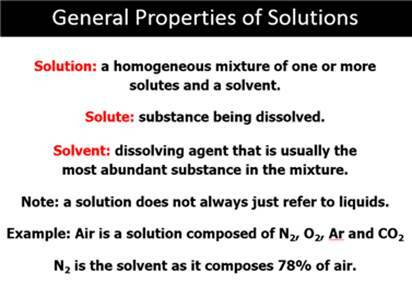 It has variable composition, that is, the ratio of solute and solvent may be varied. Part B & B1 covers the dissolving process and a discussion of solubility and temperature plus solubility and pressure of a gas in a solution is as follows. The properties of liquids dissolved in liquids focus on the main property which is polarity. Now is the time to review polar covalent bonds chapter 6. Polar covalent bonds depend on the electronegativities of the two elements. If two elements differ in electronegativity between 0.4 and 1.7, then polar covalent bonds are formed. If the difference between the two atoms is greater than 1.7 then ionization takes place. A solution containing ions must be dissolved by polar molecules as a solvent. Next you must understand the three dimensional geometry of the molecules to determine if a molecule is polar. Molecules with polar covalent bonds have dipoles, which are vectors, created by the polar covalent bonds When they are summed, if there is a net moment of force the molecule is polar. However, it is possible for a compound to have polar covalent bonds and be nonpolar when the net summation of the vectors total zero. The “Like Dissolves Like Rule” depends on the polarity of the molecules of the solute and the solvent (Table14.3 Corwin 6th is the same as Table 13.3 on page 378.. The discussion of the dissolving leads to the rate of dissolving, which is the next question in Section B1 of Chapter 7 (They do not list #3 below.). 4. Agitation or stirring-the effect of agitation is kinetic which increases the rate of solution. 1. Describe the different type of interparticle forces that can occur between atoms, molecules, and ions. 2. Distinguish between the forces called intermolecular forces. 3. What forces are referred to as van der Waals forces? 4. Draw a flow chart or diagram to summarize these intermolecular forces and show an example. 5. What are London Forces? There are three measurements of solutions in preparation problems of which two will be given and the third will be asked in Part D for preparing a solution in a laboratory. The three are: mass of solute, volume of solution (not volume of solvent-you should know the difference), and the concentration of the solution. There are six methods of measuring the concentration of a solution: Molarity, Weight (Mass) Percent, Volume Percent, Molality, Parts Per Million, and Normality. Problems for Part D will focus mainly on Molarity, but Weight percent is also fair game. The other four methods of measuring concentration will not be asked in Part D.
If the problem states the mass of the solute and the volume of the solution prepared is given, then the Molarity is unknown for one problem type. The other common problem is how to make a known volume of a known concentration of a solution and you have to find the mass. 1. How many grams of solute are needed to prepare 250 ml of a 0.0100 M KMnO4? 2. 20 grams of AgNO3 were placed in a 250 ml volumetric flask, calculate the Molarity of the Solution.